My daughter got Lego Friends for Christmas. Since then it is ALL she can think about. Lego everything, she spends most of the day playing with it, and when she isn’t, she’s talking about the next thing we can build. I can’t lie, I actually love it! Her imagination has ran wild, and for her age she comes up with some very good ideas. Mr. Fynes and I are Lego lovers too… he still has all his original bricks from the 80’s (big thanks to his Dad for keeping that bin around)! Of course, because she has such a great imagination her Lego girls couldn’t have only one outfit, that would be absurd! It was up to me to style these ladies a new wardrobe. I took inspiration from some mini figures with capes (Star Wars I think). I found some tightly woven nylon fabric that wouldn’t fray when cut (this is the key to this project) I found mine in the rain wear fabric section. Its has a micro-fiber feel rather than a plastic-ish coating. For $1 I got enough fabric to make 1000 dresses! The minimum cut of the fabric was so much I only picked up the one color. To make them different I used acrylic paint to make a variety of designs. Stick the arms straight out, and slip the arms into the holes. Fold one side of the dress around the body, and then the other. Put the hair back on the mini figure. You’ll notice the fabric is much higher in the back, the hair is what holds the dress in place. 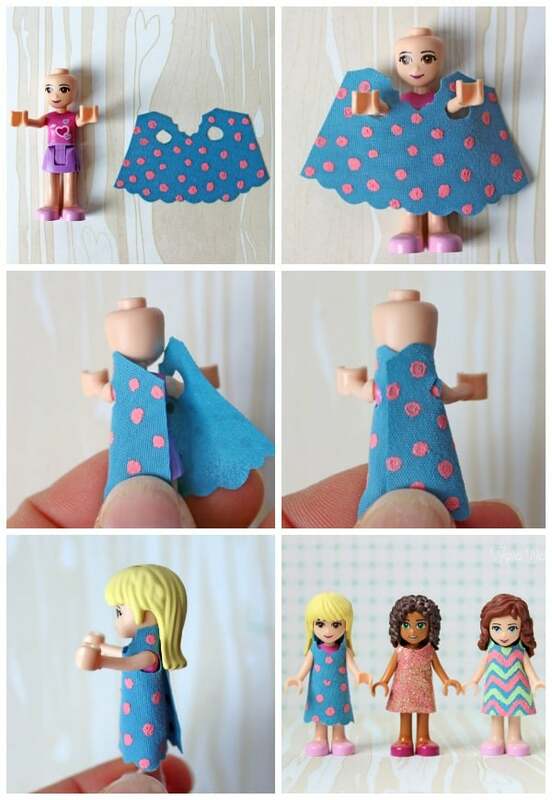 The mini figures can stand or sit and the dresses will stay in place. Some days they are dresses, sometimes nightgowns, the possibilities are endless with a little ones imagination! 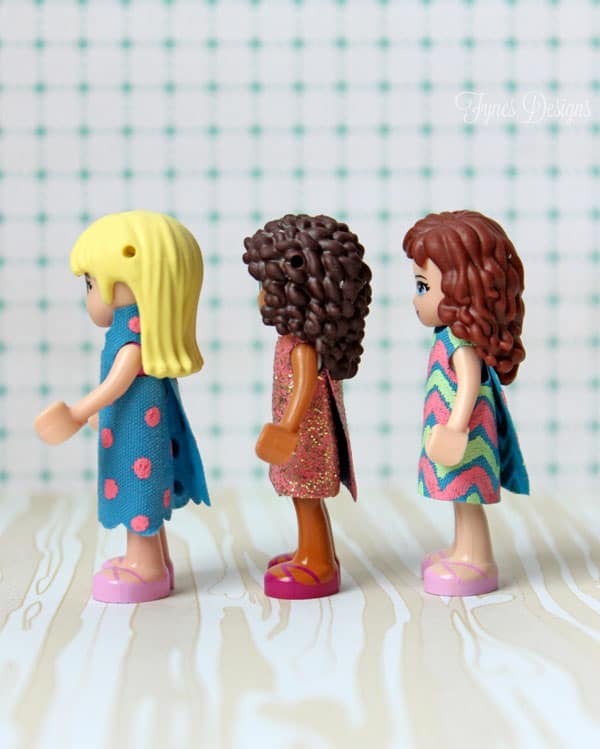 The girls are off to the beauty shop in their new Lego Friends dresses! A side note… if you’re wondering about the holes in the friends heads if you buy the Andrea’s Bedroom little set you get loads of hair accessories for them! 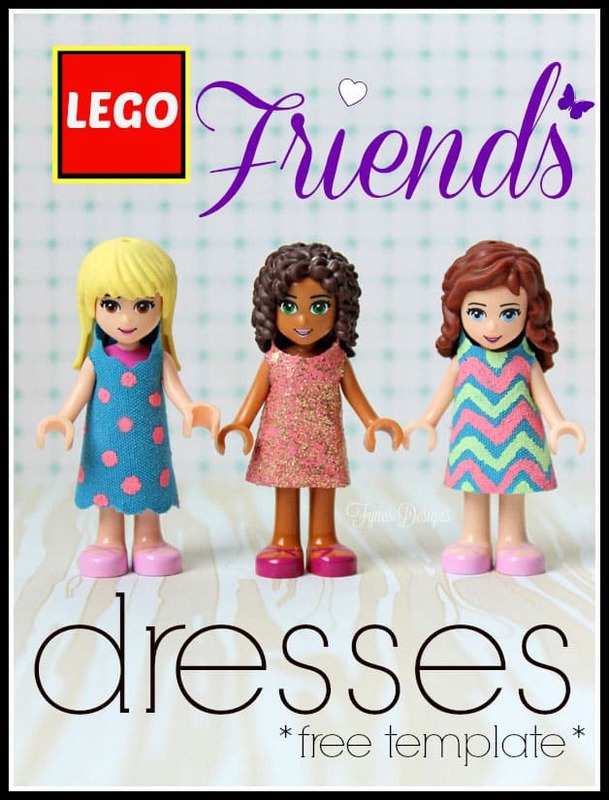 Get the Free Template for the Lego Friends Dresses here! Print and cut out, I used a small hole punch for the circles. Trace the template onto the fabric, cut around the outside. To easily cut the armholes you can fold the fabric in half at the hole and cut a half moon. Thats it, then paint if desired! Easy peasy and tonnes o’ fun! Looking for another fun toy for the kiddos? 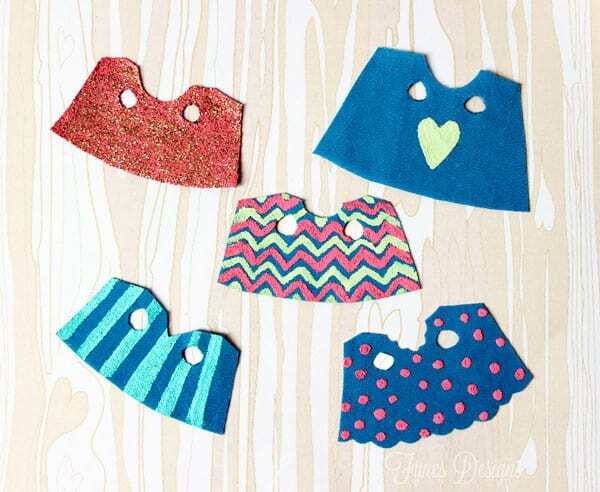 Check out this free Princess sock puppet pattern. Disney Princess Puppets- FREE Pattern! Love these! Can’t wait to try it with my daughter! So clever, Virginia! 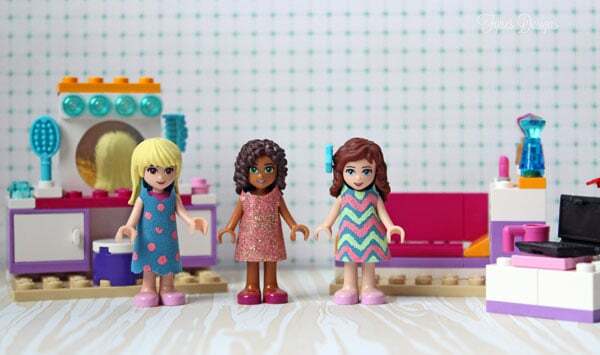 Lila just got her first set of Lego Friends – this is going to be so much fun to do with her! She’ll have loads of fun with it! We need to get us some of those cute calico critters! Just printed the template for my girls! What a fun idea! These are so fun Virginia! 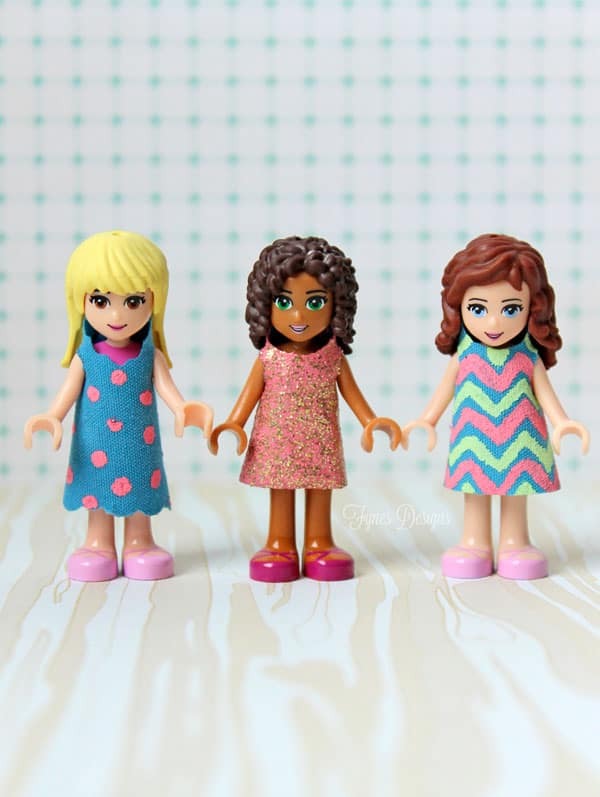 My daughter loves Lego Friends…I’m going to show her this after school today! Those are so cute! I love the idea of painting the fabric. Looks easy too – perfect for kids to decorate their own. This is so adorbable Virginia! My daughter would have loved this when she was little! I’m glad you like them April. I did try felt but the arm holes got stretched very easily, and I think a knit would unravel. Something that you could singe the edges would be good if you can’t find the rain-suit nylon. Good luck! so cute! my daughter will love this idea! What a clever idea! And I love the painting idea. Thank you so much for sharing. Thank you for the idea! Printed off pattern and will be making these for my granddaughter. I think I’ll make a “bead” necklace and glue it to the dress. The possibilities are endless. I used several different cotton fabric scraps. To keep the fabric from unraveling, I stuck colored duct tape to the wrong side of the fabric. It works really well to help the fabric keep its shape and the holes not to stretch out. They won’t last forever but have added hours of dressmaking and Lego playing, without spending a lot of money. We also added decorative washi tapes to both sides. I even found “Frozen” decorative tape and we made new fashions for our princesses.